The votes are in, forget The X Factor, we’re looking at the number one bad Christmas joke. A poll of 2,000 Brits revealed one in five selected the festive rib-tickler as the cringiest joke ever pulled out of a traditional Christmas cracker. It was followed by: What do you get if you cross Santa with a duck? A Christmas quacker!’ and ‘What’s a horse’s favourite TV show? NEIGH-bours!’. But it also emerged, despite such weak gags, the pull of Christmas crackers remains strong for Brits, with three quarters admitting they enjoy reading out the jokes over Christmas dinner. The study was commissioned by electrical retailer Currys PC World as part of its ‘Magic of Christmas, Upgraded’ campaign, which has seen them join forces with award-winning British stand-up comedian, Gary Delaney, to ‘upgrade’ some of the nation’s worst Christmas cracker jokes. We all know that traditional Christmas cracker jokes are weaker than your Nan’s Wi-fi password. As Currys PC World is upgrading Christmas this year, I’ve been pulled in to help change all that. I’m hoping my joke upgrades will have Brits crack-ing up across the country on Christmas Day. The survey also found more than a third of Brits confess Christmas crackers are a festive tradition they secretly love, along with cheesy Christmas jumpers, carols and Christmas music. And more than two thirds of Brits say crackers are considered part of a ‘normal’ Christmas Day for them. But almost eight in 10 families only pull crackers because it’s in keeping with a festive tradition. However, six in 10 Brits have been left feeling disappointed by a Christmas cracker joke, with half of those polled believing there’s room for improvement. In true British style, almost one in five even admitted they only laugh ‘out of politeness’ when they hear a Christmas cracker pun. The research, carried out via OnePoll.com, also found Brits will pull four crackers each this Christmas period, with a fifth also enjoying the free gift that comes inside. A mini-torch is the most popular cracker gift, followed by a set of tiny screwdrivers. Other popular cracker gifts include bottle openers, puzzles and the common flipping-frog toy. Two thirds even claimed to have kept a Christmas cracker gift, in case it was useful one day. The UK’s largest electrical retailer has pulled out all the stops for their latest festive campaign, creating the Currys PC World Ultimate Christmas Cracker, a major upgrade on the traditional – filled with the top 24 of tech gifts for 2018. 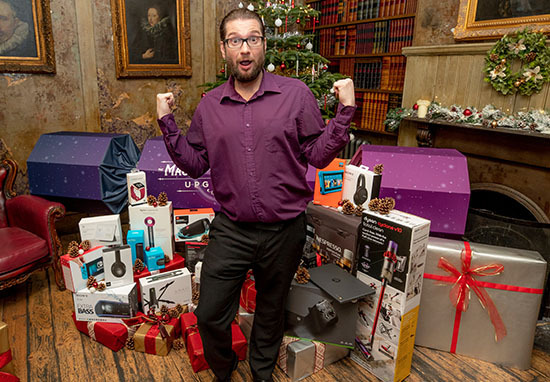 Brits can enter for a chance of winning all 24 gifts, featuring household favourites from top brands including Dyson, Amazon and Nintendo, by heading to Currys PC World’s Facebook page and submitting their personal worst-ever Christmas cracker joke.